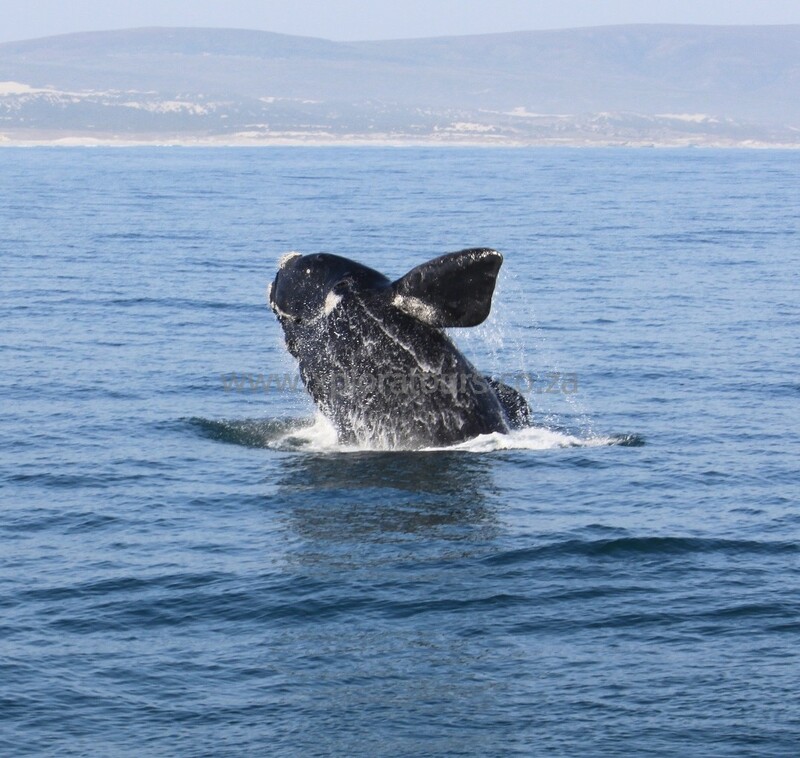 Right whales reach a maximum length of 17 m and a weight of 80 to 90 metric tons. These are black, stocky animals and the only large whales that lack a dorsal fin. With short, paddle-shaped flippers and prominent patches of callosities (raised skin patches) on their broad heads, together with their slow moving behaviour make them very easy to identify. Many individuals have large white patches, mostly on the ventral surface and during breaching these markings regularly lead to observers identifying it as a killer whale. About 4% of calves are born almost completely white, but will change to an overall grey colour within the first year. Both these white markings, as well as the callosities, which are markedly different on all individuals, are very useful in identification. Callosities are rough, raised skin patches, essentially precisely where hair would grow on a humans face – above the eyes, on the chin and above the upper lip. They are inhabited by parasites, which cling to and feed off the discarded or dead skin. The function of callosities remains a matter of speculation. Whereas all toothed whales have a single blowhole (nostril), baleen whales have double blowholes, and southern right whales are unique with their typical V-shaped blow (condensation on exhaling). Southern right whales are specialized filter feeders, using their finely meshed, long baleen plates to trap their prey. They do not undertake the spectacular feeding display of humpback whales but rather use a steady open-mouthed movement, nor do they feed on such a large variety of organisms. Right whales almost exclusively feed on copepods or krill, which are only present in large accumulations in the cold sub arctic and sub Antarctic waters, and a few cold-water upwellings on the edge of continental shelves. Both calving and mating takes place in the sheltered bays along the coastlines of the southern and northern continents in temperate seas (13 to 20°C). It is during the winter months that they leave their feeding grounds and migrate to the warmer and more hospitable in-shore waters, where they clearly do not engage in any substantial feeding for between 4 and 6 months. It makes perfect sense to give birth to their calves in relatively warm water, as the neonates lack the adequate insulation of adults and would likely die of hypothermia in the cold, stormy polar waters. Shallow, sandy beaches are also clearly preferred for calving, as this prevents the new-born calf from sinking too deep to get to the surface for its first breath. “Midwives” often assist with this and are thought to oftentimes being related to the birthing cow. Calving is thought to occur only every 3 to 5 years, with single young born after a gestation period of 12 months. After birth the calves have access to copious amounts of milk (600 litres per day have been suggested), and within 3 months the calf is ready to make the journey back to the feeding grounds. Calves are born at 5 to 6 m in length and grow at a rate of around 3 cm per day. The lactation period is estimated at between 4 and 8 months. 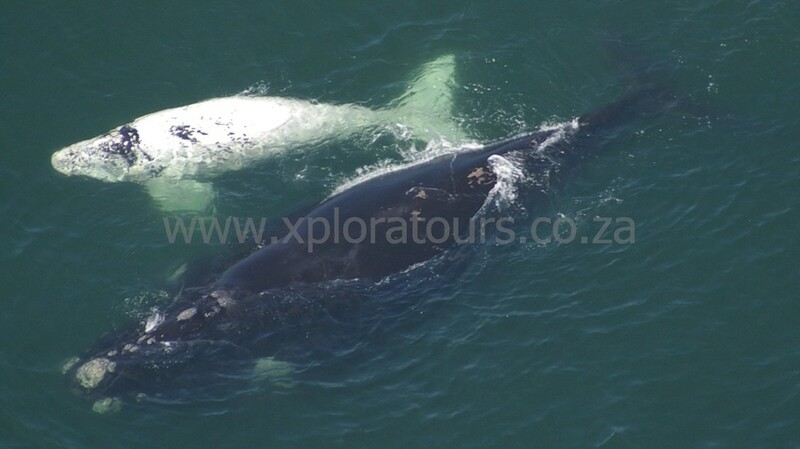 The mating of right whales usually involves several males attempting to copulate with one female, often displaying quite forceful behaviour towards the other males in the process. It seems apparent that they will mate successively and that each subsequent male’s sperm will at least partly displace that of the previous one. Thus it has been reasoned that whichever male mates last, has the best chances of becoming the father of the offspring. Mating takes place mostly in spring and toward mid-summer only some cow-calf pairs remain along the coast. It is estimated that right whales live to be 90 to 100 years. Right whales have a circumpolar distribution and inhabit sub arctic and sub Antarctic waters between 30° and 50° north and south. Due to over exploitation the northern population of right whales is virtually extinct, but in the Southern Hemisphere populations show a slow increase of around 7% per annum since international protection in 1935. 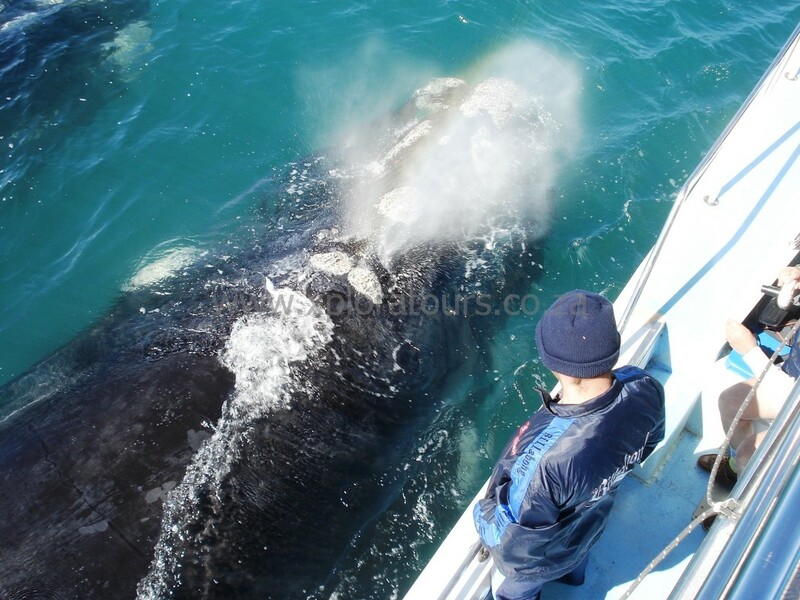 An estimated 3000 to 4000 southern right whales are distributed into 3 major populations; the largest contingent frequenting the South African coast, another along the Argentinean coast of Patagonia and a third in southern Australia. Still but a fraction of initial stocks, much of the role right whales play in eco-systems and even more in respect of their social behaviour remains a mystery. How much genetic exchange takes place between these populations is of great interest to scientists. Both the introduction of new genes to any of these small populations, as well as the contamination by any afflictions would be great significance to the continued sustainability of the southern right whale. Whales have been hunted by man for many centuries, but it was with the advent of technology that whale populations world-wide were taking serious losses, until several species were driven almost to extinction by the mid-1900s. One of the most seriously affected was the right whale, so named because it was the “right” whale to pursue; frequenting the same inshore areas year after year, being slow moving and floating when dead, and most importantly being very rich in oil and baleen. Curiously, very little antagonistic behaviour toward man has ever been observed in unwounded whales and even after decades of intensive persecution, humans and boats were clearly not identified as the “enemy”. Whether this is due to a positive disposition or some kind of kinship towards man or the inability to adjust to changing environmental factors, or even a lack of intelligence, remains a matter of speculation. Yet, for such large-brained animals not to react with some kind of adversity to their persecutors seems out of synch with the behaviour of virtually all other species. However, particularly due to this inability to defend itself these enigmatic giants are worthy of our whole-hearted efforts to protect for all future generations. It is a frightening thought, that even a slight rise in the temperature of the world’s oceans may impair the production of adequate krill reserves essential to sustain even this small remaining population of right whales. Boat trips take you out onto the ocean to view them close-up.